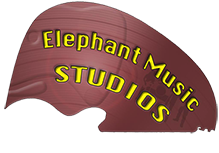 Welcome to Elephant Music Rehearsal Studios. Our rehearsal studios are conveniently located on the north side of Brisbane, our services include rehearsal rooms and demo recording. We cater for musicians from beginner to professional, of all ages. Whether you're a seasoned professional, or just need some room to get together with some mates for a jam, we have a rehearsal studio to suit your needs. In our totally live recording studio we've recorded anything from a soloist with backing tracks up to a 20 piece school band, all totally live. You can set up on our stage, we'll mic everything up and record your band as you would play at a gig or you can spread out around the room. We record up to 24 tracks with our Presonus 24.4.2 digital desk. Then we do some post mixing and editing. Backing vocals can be added later if required. You can then select a 30-60 second grab from each song and we'll edit those into a compilation demo track. Find out more. . . .